My little buddies after today’s care. 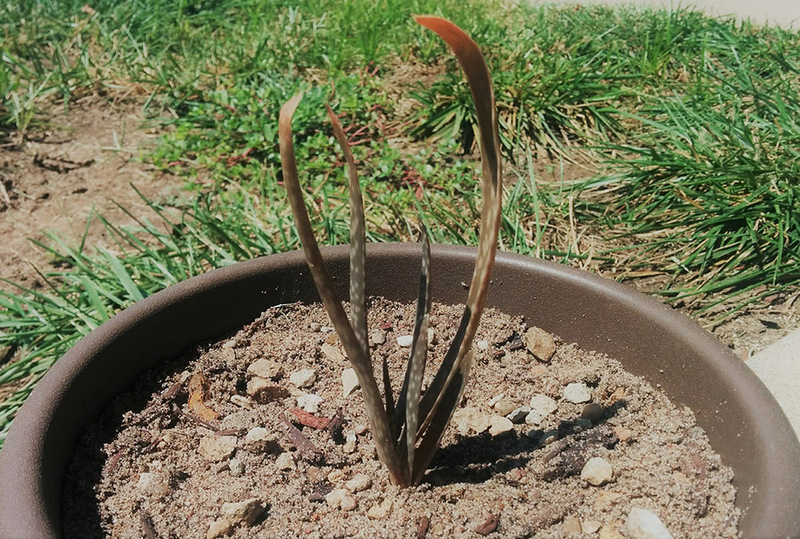 Right now I’m working on keeping two little aloe sprouts alive. Gifted to me earlier this year by my wonderful sister, Lisa, there were originally three but I threw one away after a month or two because I had already made mistakes and it seemed beyond saving. Differing sources report different treatment conditions for aloe, so everything here is my best approximation at what they actually need based on the many things I’ve read and what I’ve seen my plant respond to. So I have three camcorders of varying quality (thanks, dad! Seriously he ends up with extras of all kinds of stuff and I get free hand-me-downs, it’s pretty great). The two newer ones have apparently-interchangeable batteries (having tested it one-way at least–the other battery is totally dead) and all three charge via an extremely short USB cord directly out of the camera; I have no dock for any of the batteries. I find myself not knowing quite where to begin, as I don’t imagine everything here will be taken super well. But that’s kind of the problem and the point of the post. We’ll start with some backstory: Some five years ago, my dad turned me on to the existence of Skepchick, and Teen Skepchick in particular since TS was looking for new bloggers and he figured that might be my jam. I wrote my first ever semi-professional piece, it was published on Teen Skepchick as a guest post, and a couple weeks later I was on the writing team. So began my involvement in the atheist community. Being a writer on a sister site to something as major as Skepchick was a fantastic opportunity, and it set me on a course to developing an incredibly supportive network of friends and acquaintances made up of my peers. I’m still friends with a handful of my fellow TS bloggers today–actually I do a podcast with one of them. I met more people at conventions, started writing for Queereka and then FTB (Freethought Blogs), sat on panels and even gave a talk, accruing new friends all the while. Until I found myself in the middle of an amazing, interconnected group of skeptics, atheists, feminists, and progressive thinkers. I’ve known many of these people for years, and have always appreciated how fortunate I am to be among people who accept me (including many of my fellow bloggers here at The Orbit). Today I’m announcing the launch of »my Patreon page.« Most of you probably know what that is, but if you don’t: it’s a way for creators to be paid for work they normally do for free, such as making YouTube videos and blogging, via monthly pledge donations. My Patreon is mostly to support my YouTube endeavors; it’ll help me rebuild my aging computer and set up a proper recording space. (I’m using a fur-covered, torn green screen as a background. Save me. T_T) But! I’m also offering rewards on there that pertain to my writing, as a way to encourage me to use this platform more. Even if I can’t come up with some super srs bsns for this blog, I want to give it more attention. I’ve had this idea to over-explain the lyrics to World of Warcraft parody songs for several years and I think I’d get a kick out of it, even if no one else does. So, if you want to support my creative works and give me things to write about, check out my Patreon! If you don’t want to or can’t support it, I’d still be grateful for a share. CONvergence is coming up soon, here in just over a month, and the events schedule has been posted! Which means that I now know and can share with you which panels I’m going to be on! DID I MENTION SOMETHING ABOUT EXCITEMENT?? *ahem* Anyway, the full schedule is available here, so you can check out all the amazing things that are going to be happening. There’s an art show, movie screenings, a pie contest, and signings. And, of course, panels! CATHY BRENNAN IS A FAKE GOTH?? Alright, y’all. Just be aware that I’m super pissed off about this, but I’m gonna try not to rage too hard. CN for transphobia. Frivolous Fridays: NEW SEASON OF GoT! Welcome to a new thing we’re doing! As the blurb says, we want to encourage each other to blog about whatever we want to our heart’s content. I definitely feel obligated to write about Serious Important Business every time I blog here, so we thought it would be nice to have an open day to talk about silly things that don’t necessarily have to make a punchy point. It mixes the solemnity of what many of us write about with some levity, so it doesn’t become overwhelming to you or our bloggers.